Most droughts can be broken within a two week period. That is, within two weeks of beginning an operation, rainfall resumes and then continues on an average to above-average cycle for the next month. Often, the precipitation continues average to above-average at least for the remainder of the season. In some cases we will guarantee above-average precipitation for the month following drought breaking operations. The effects of rainmaking in an area are usually region wide. That is, the rainfall will increase throughout large swaths of the Southwest, or the Northwest, or the upper Midwest , etc. At the very least, numerous counties will be in the relief zone so the benefits are widespread. In chronic drought areas, the best time to begin rainmaking operations is at the beginning of the rainy season. 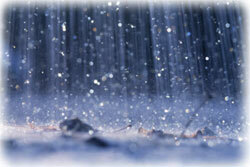 However, rainmaking operations are beneficial to a droughted area at any time. True rainy seasons exist west of the Rockies in the American West; the rest of the country receives similar amounts of rain in every season and so will benefit equally throughout the year. When droughts are acute and suddenly critical, with huge forest fires or massive heat waves, rainmaking operations are useful and helpful any time of the year or place.